Should You Buy Cuisinart CPK-17 PerfecTemp Cordless Electric Kettle? 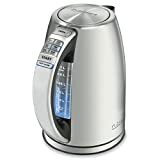 Thinking of Buying A Cuisinart Perfect Temp Electric Kettle? In my opinion, the price of this kettle is quite high. This was one of the first things that stuck out for me when I was considering buying it. I am the kind of person who doesn't want to spend too much unnecessarily, so I debated whether it was worth spending so much on a kettle. At the end of the day, I went through many reviews on Amazon.com, and decided to purchase it - and so far I've been thrilled with that decision! The best thing about this Cuisinart Perfec Temp is the fact that it has a stainless steel inside. There are very few kettles with a stainless steel interior - many have stainless steel exteriors but glass or plastic interiors. Buying a plastic kettle was out of the question for me, since after a few uses, water boiled in a plastic kettle gets a kind of "plastic" taste. In addition, it's not too good for your health to use a plastic water container or kettle, according to doctors. So I decided that it would have to be either a glass or a stainless steel kettle. However, glass is more susceptible to calcification, so I decided to go for a stainless steel one. There were very few options available once I'd narrowed down my list of necessary features to include a stainless steel interior, and the Cuisinart stood out for all its additional features. What I really like about the Cuisinart is the ability to set your desired temperature. If you like making coffee in a french press coffee maker or even any other kind of coffee maker, then you know how important it is that the water be just below the boiling point, so that the grounds are not burnt. On the other hand, you need very hot water to make tea or oatmeal. With this kettle you can easily get the desired temperature - you don't need to constantly watch it to ensure the temperature is right. The Cuisinart also has a "keep warm" feature which is a great tool for those times when you boil the kettle, and then get engrossed in a tv show and get up during commercials to make the tea. Overall, this Cuisinart kettle is a great addition to any kitchen.